1. Don't use the STAR method when writing your statements. Most government websites recommend using the STAR approach when writing selection criteria. However, this is an outdated way of addressing selection criteria and most people who win a job don't use this way of writing their statements. The government websites that suggest it are usually also old and haven't been updated to take into account more modern approaches for writing job applications, or reflect what is currently happening around the shortlisting table. While the STAR approach might help you to get your statements down on paper and can be a good way to get your writing started, it will provide a second class application that won't compete with the best application writers. You can read more about the STAR approach here. 2. Fill your application with lots of examples, but not any kind of examples. Make sure your examples are not only relevant to the type of job your are applying for, but also the level of the job your are applying for. 3. Delete all theoretical statements. If you come across any theoretical statements when you proof read your selection criteria - delete them! Unless it is a 'knowledge' selection criteria and it is obvious in the selection documentation that the selection panel are only wanting to hear about what you know, you should not include any theoretical statements, at all. 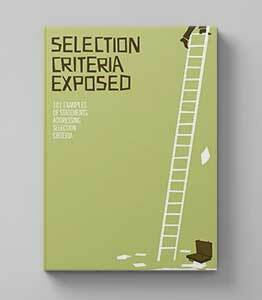 Even if it is a 'knowledge' criteria, back up your theory with evidence of how you've used it in the work place. 4. Plan your responses, don't ever just sit and write. Planning your selection criteria is a crucial step in ensuring that you demonstrate what the selection panel want to know, and in the way they want to know it. If you don't plan, your statements will turn out to be sloppy, difficult to make sense of and easy to forget. Everything you don't want! understanding why each criteria is important in the job, and conveying this understanding with relevant examples. developing an understanding of what your strengths are relating to each criteria and expressing these with relevant examples. 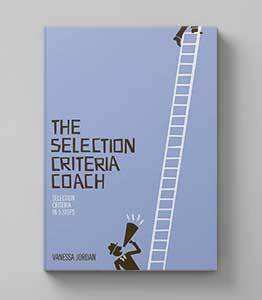 (Our ebook "The Selection Criteria Coach" has a 5 step plan and lots of tools to help you do this easily). 5. Use the keywords and language from the selection documentation. This includes the job description in your responses to make them more relevant to the position. The use of keywords is important for two reasons. Firstly, it demonstrates to the panel that you are familiar with the position and the requirements of the position. Secondly, it aligns your knowledge, skills and abilities with the knowledge, skills and abilities required in the position.